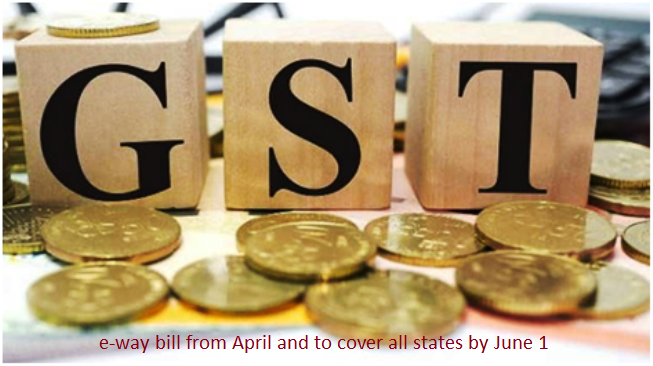 Businesses will continue to file summary sales return GSTR-3B till June as the GST (Goods and Services Tax) Council on Saturday 10 March �18 extended the present system of return-filing by three months. Briefing reporters after the council meeting, Union Finance Minister Arun Jaitley said electronic way or e-way bill for movement of goods between States would be implemented from April 1. However, for intra-State movement, the e-way bill would be rolled out in a phased manner beginning April 15 and would cover all the States by June 1, he said. Value of exempted goods has been excluded from value of the consignment, for the purpose of e-way bill generation. Public conveyance has also been included as a mode of transport and the responsibility of generating e-way bill in case of movement of goods by public transport would be that of the consignor or consignee. Railways has been exempted from generation and carrying of e-way bill with the condition that without the production of e-way bill, railways will not deliver the goods to the recipient. But railways are required to carry invoice or delivery challan etc. Time period for the recipient to communicate his acceptance or rejection of the consignment would be the validity period of the concerned e-way bill or 72 hours,whichever is earlier. In case of movement of goods on account of job-work, the registered job worker can also generate e-way bill. The council could not decide on a simplified GST return form and entrusted the ministerial panel under Sushil Modi to chalk out a single-page form, which is simpler and evasion-proof. Copyright © 2019 PORT TO PORT - Shipping Services Portal ( Sagar Sandesh ). All rights reserved.